TOP ROW (left to right): (unknown), Glen Blackhart, Hiram T. Todd, Jack W. Morey, Albert M. Elton, John Addington, Paul Price, Paris P. Dills, Frank P. Gautiello, Howard Claxton, Frank P. Kibby, Richard A. Maher. BOTTOM ROW (left to right): Clarence C. Covey, Henry Hulme, Albert R. Simone, Sam Dudlext, George Ellis, (unknown), Richard E. Launer, Donald F. Hinkley, Albert A. Burrow. 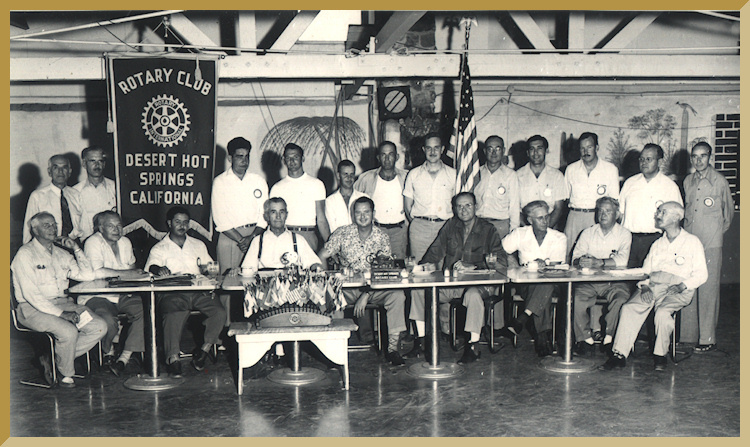 Keep Up to Date with Upcoming Rotary Events! We hold two extra evening meetings every first and third Wednesday of the month. First Wednesday is at Miracle Springs Resort and Spa - 10625 Palm Dr, and the third Wednesday "rotates", follow our website and Facebook for info!